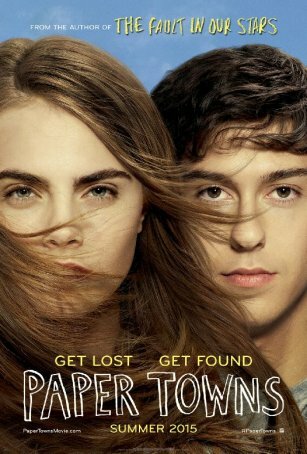 Paper Towns is the third coming-of-age story to reach screens during the summer of 2015, following in the wake of the vastly superior Me and Earl and the Dying Girl and Dope. Based on the novel by John Green, Paper Towns is an exercise in artifice. The contrived storyline offers little opportunity for characters to grow and the meandering narrative trajectory and anticlimactic ending will have some viewers wondering why they bothered. Coming-of-age stories work best when they are populated with relatable characters. In Paper Towns, the narrator and protagonist, Quentin (Nat Wolff), is grounded but uninteresting. He is defined by a single personality trait: his conformity. He's a studious guy who gets good grades, never cuts class, and doesn't sneak out of his house at night. He is seduced out of his cocoon by the girl across the street. She's Margo (Cara Delevingne), one of the most popular girls in school and Quentin's private obsession. Like Quentin, Margo isn't a real person - she's a wafer-thin movie confection defined exclusively by her free-spiritedness. Since Paper Towns is presented from Quentin's perspective, it's understandable that Margo would be so poorly drawn (we're seeing her as he sees her, not as she is). It's less explicable why the same is true of Quentin. The movie opens with an interminable 30 minute setup. For about half that time, we are treated to glimpses of Quentin and Margo's childhood as they grow up as best friends. (Their differences are italicized in a scene where they are shown bicycling side-by-side with him wearing a helmet and her without one.) Through this, Nat Wolff provides a voiceover talking about how invigorating it was to be around Margo but how, in the end, they drifted apart. Then, one night a few weeks before the Senior Prom, she hijacks him to be her accomplice on an "adventure" that includes a series of revenge-fueled pranks. After that, she disappears but leaves behind a series of clues for amateur sleuth Quentin to piece together. In order to find the love of his life, he must leave his comfort zone, even going so far as to skip school and embark on a 1200-mile road trip. There's a saying about road trip movies that the journey, not the destination, matters. In Paper Towns, the journey is dramatically inert - an empty half-hour comprised of minor misadventures and inane chatter among the five friends in the car. The movie's final act is disappointing. I admire what the film is trying do with respect to defying conventions but the means to achieve this are awkward. After sitting through about 95 minutes, one deserves a little more than sermonizing about what it means to grow up. Wolff, who was fine in The Fault in Our Stars (last year's Green adaptation), shows little in the way of emotion or range here. It's hard to say whether the blame lies with the actor (and, by extension, director Jake Schreier) or with the character. Quentin is dull and his development as a person seems more cosmetic than organic. Has he really changed? British model Cara Delevingne imbues Margo with an intriguing quirkiness but she's not on screen long enough to make more than a fleeting impression and she and Wolff share no chemistry. The actors who portray Quentin's friends and traveling companions are as forgettable as the characters they play. Paper Towns is perhaps best viewed as a flight of fancy. That's the only way to overcome the "suspension of disbelief"curve. Little of what happens in the movie - either during the initial night adventure, the subsequent investigation, or the road trip - could happen in the real world, so we must assume this is a parallel universe where adults are as relevant and intelligible as those in a Charlie Brown cartoon. This is, after all, a movie about teenagers. Why clutter it up with old people? To an extent, Paper Towns is all about perspective. Seen through the eyes of Quentin, this is the story of how a boy, trapped by his own fears and insecurities, learns to break free as a result of his single-minded pursuit of love. A different but no less valid point-of-view might argue that this about how a boy, driven by an unhealthy obsession for a girl, acts recklessly and irresponsibly (nearly causing death or injury to five people) in his stalking of her. A better, more self-aware movie (consider The Spectacular Now, also written by the duo of Scott Neustadter & Michael H. Weber) would have found a way to fuse the two interpretations, but this rote screenplay lacks the necessary insight. The success of The Fault in Our Stars has led distributor Fox to be bullish about the prospects for Paper Towns, but the films aren't comparable. The Fault in Our Stars is heartfelt and guileless - a touching depiction of what happens when youth clashes with mortality. Paper Towns is shallow and chokes on its own glibness. It's hard to believe both movies germinated from the pen of the same author.